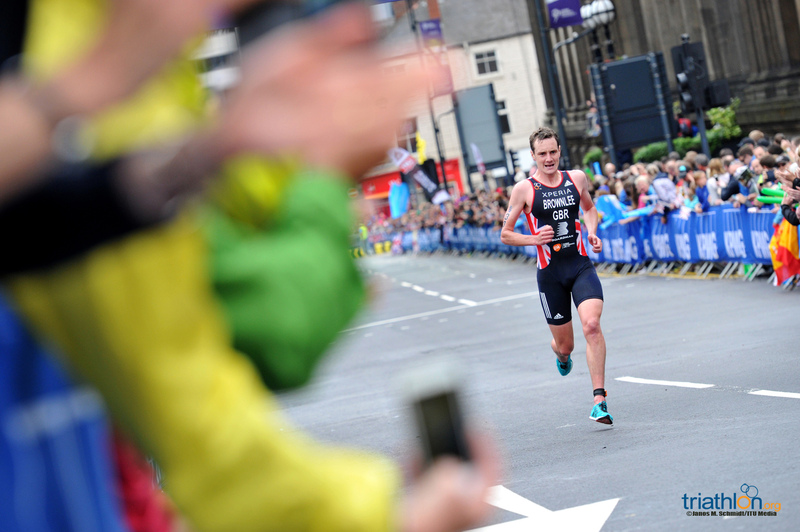 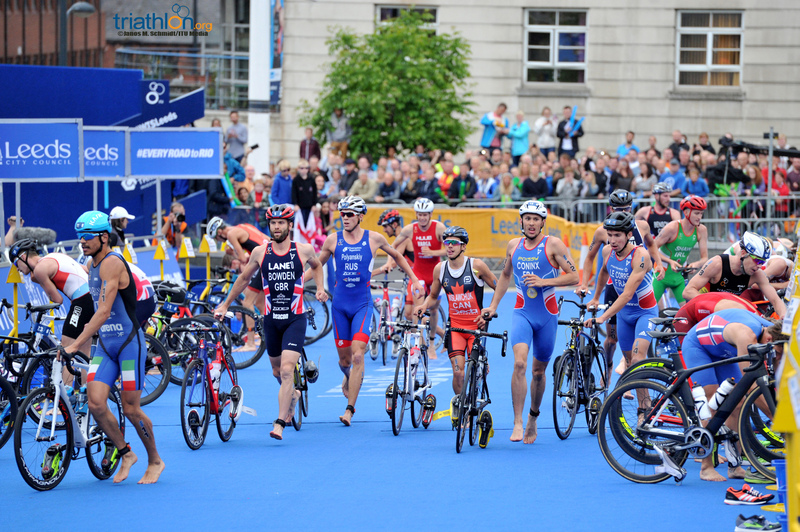 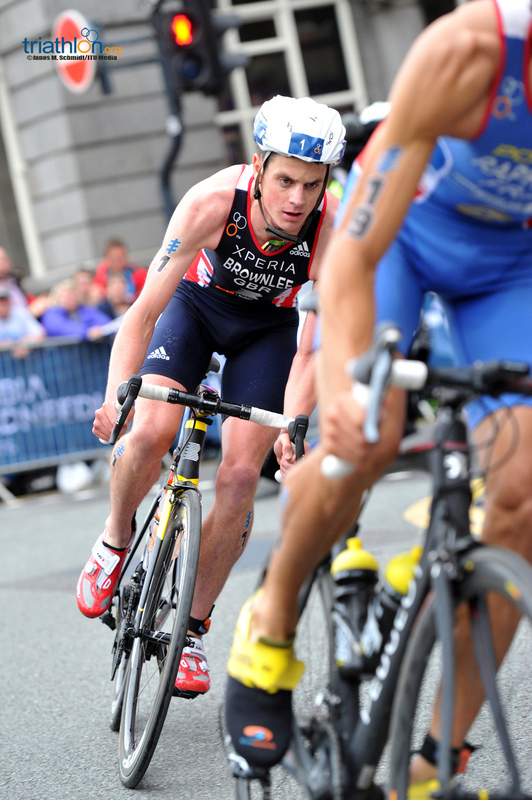 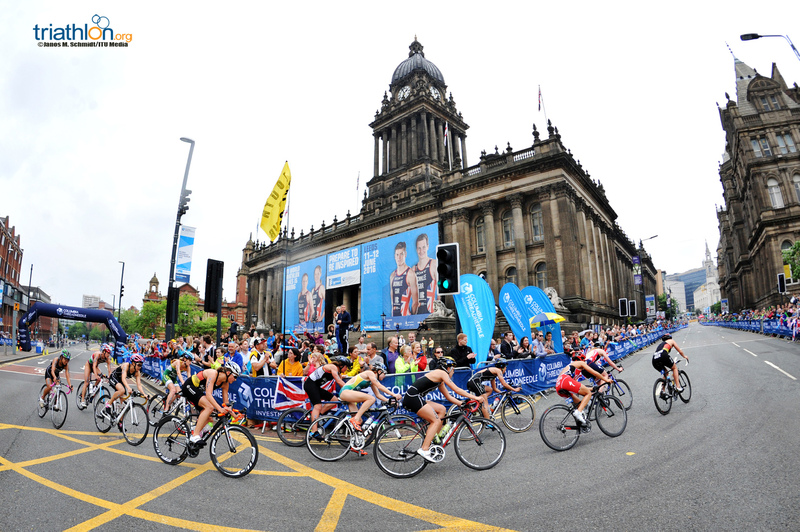 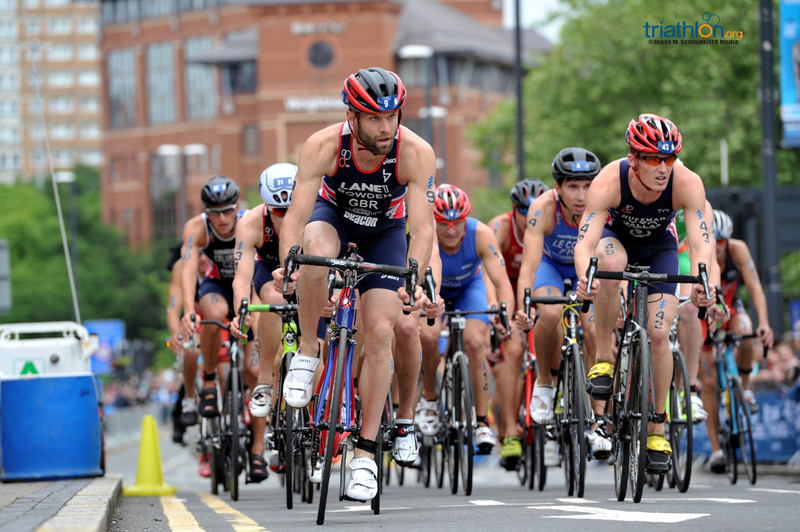 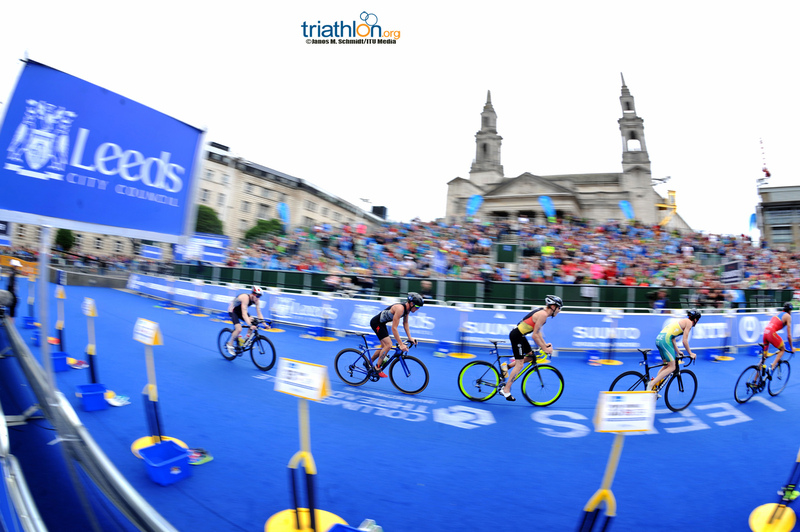 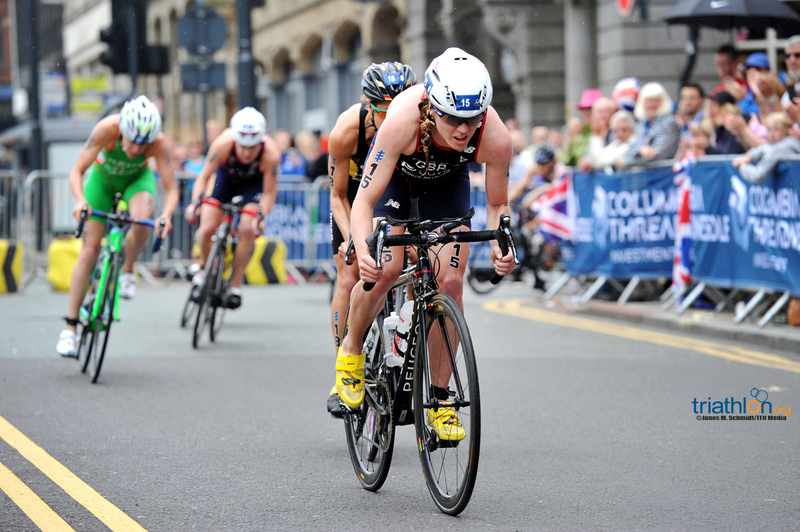 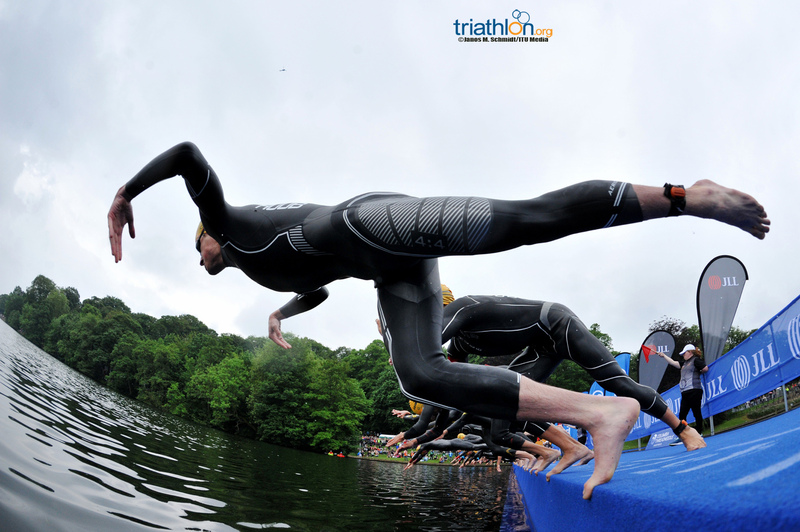 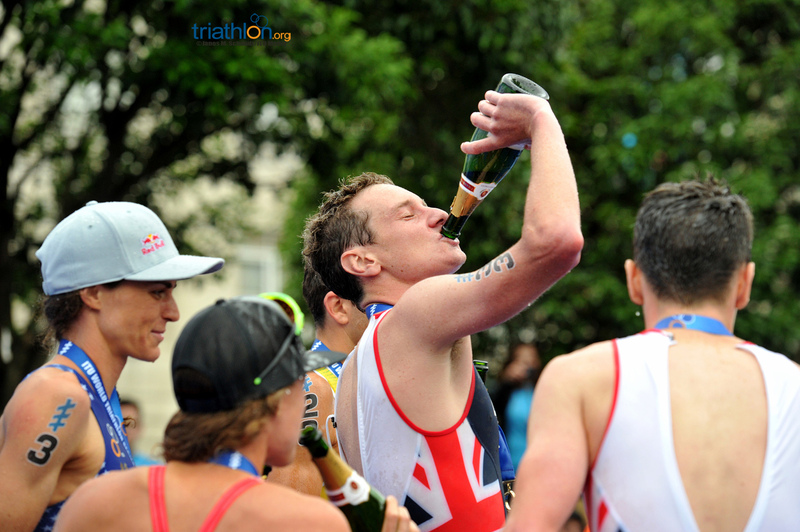 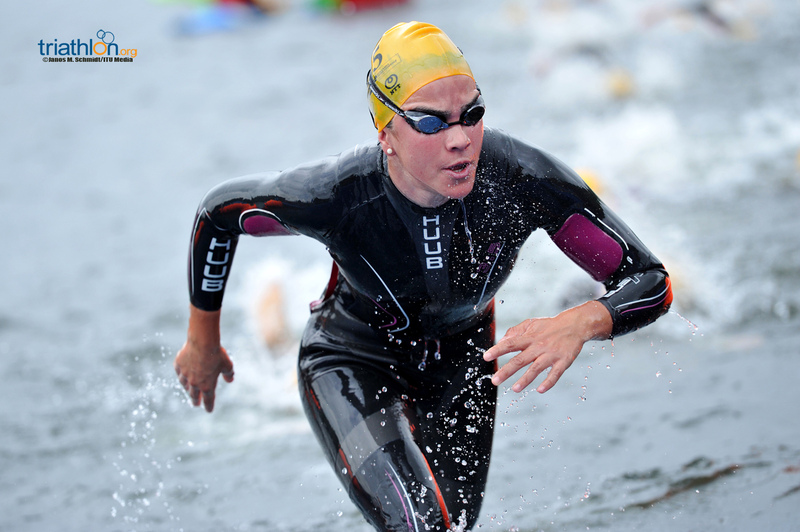 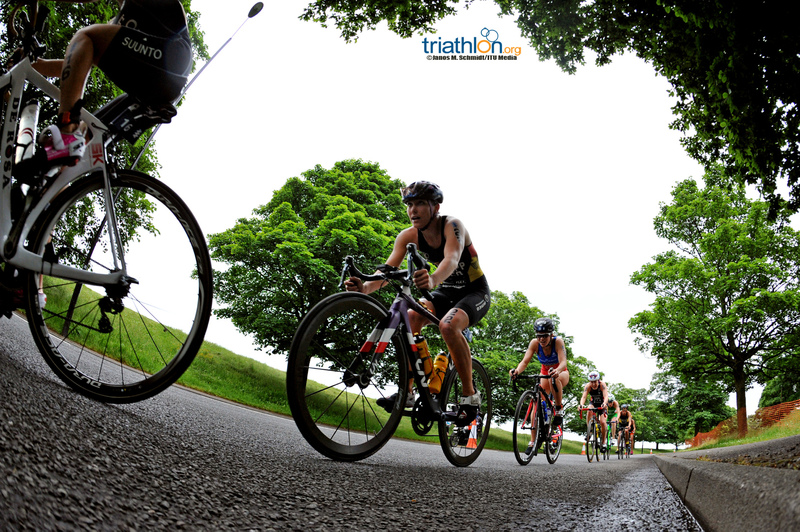 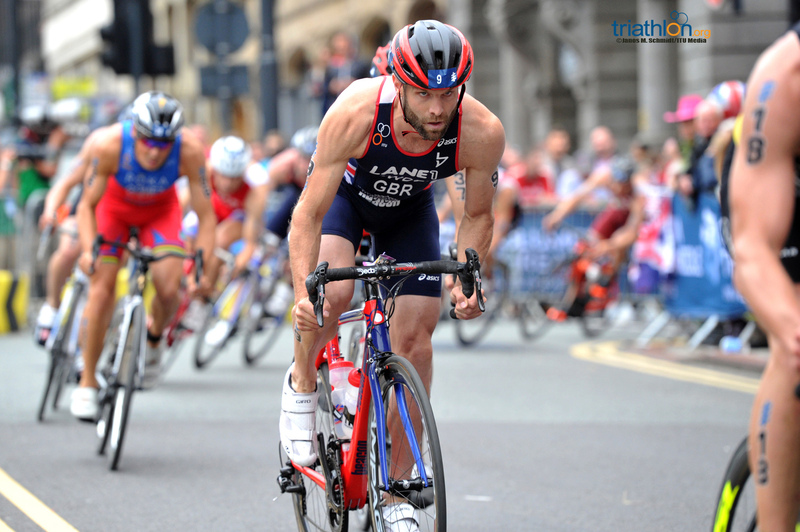 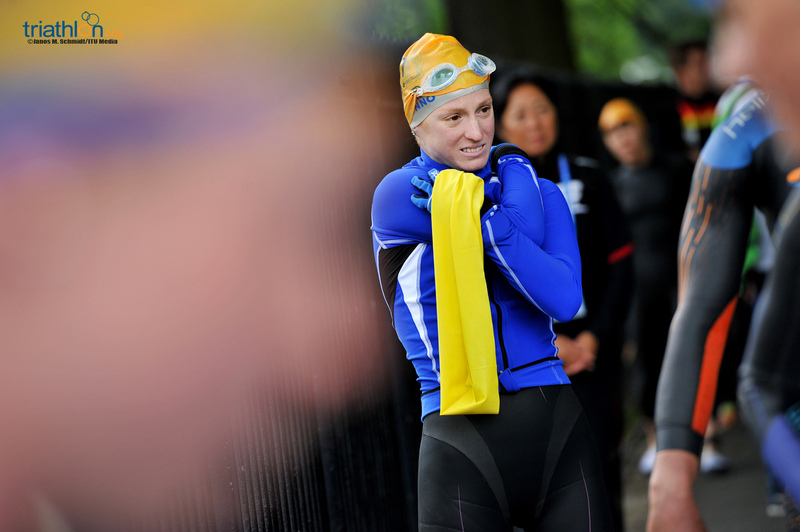 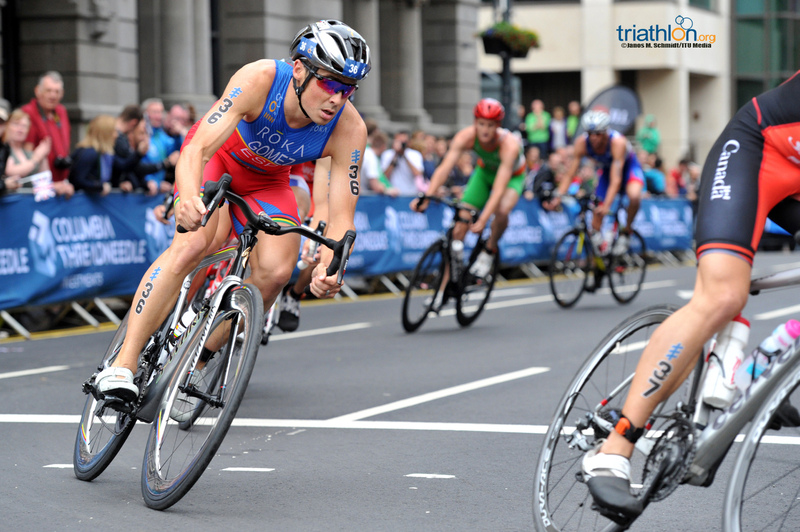 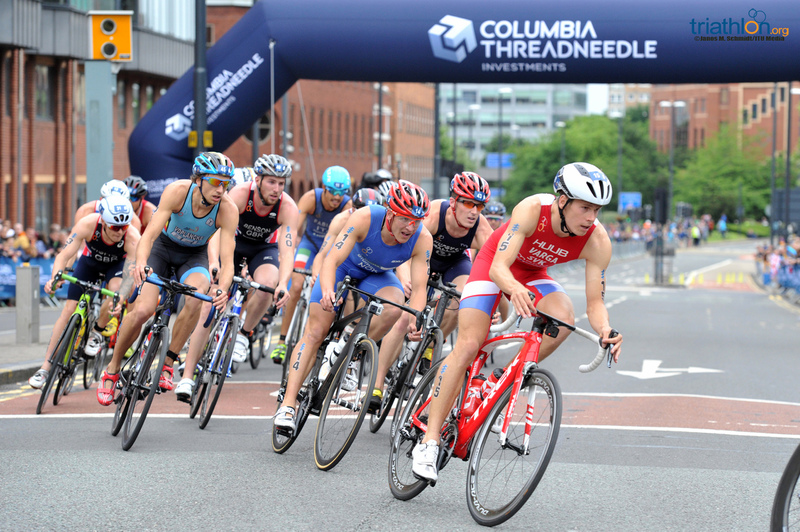 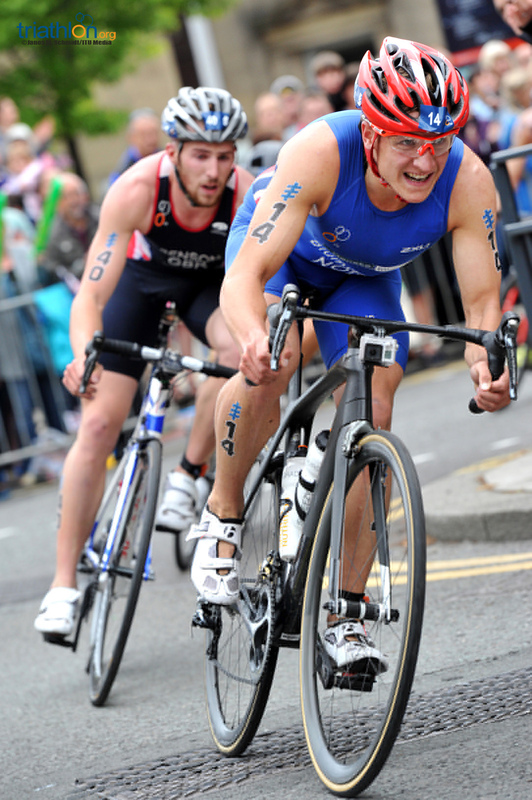 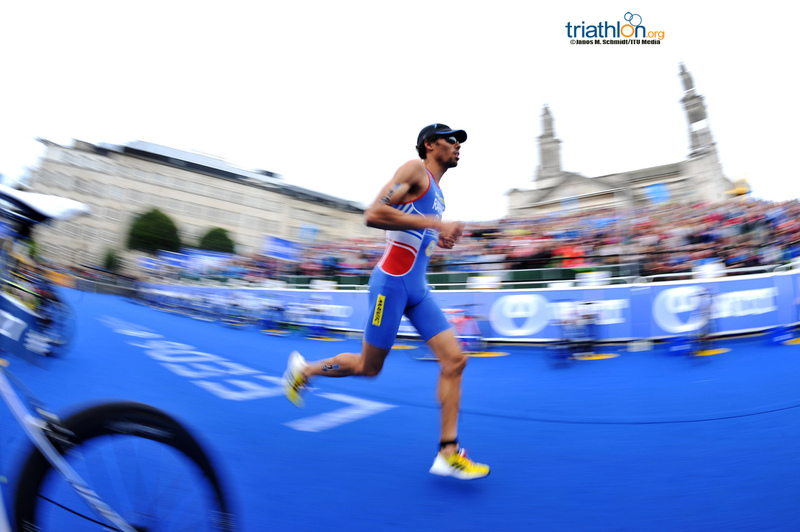 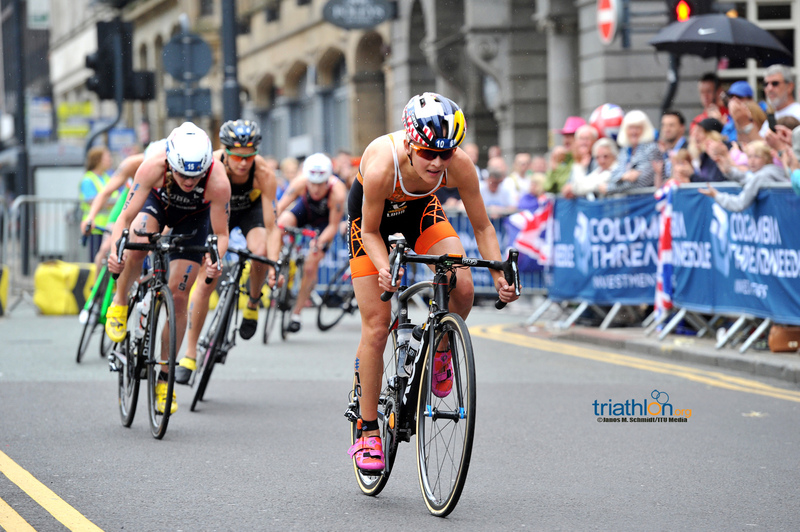 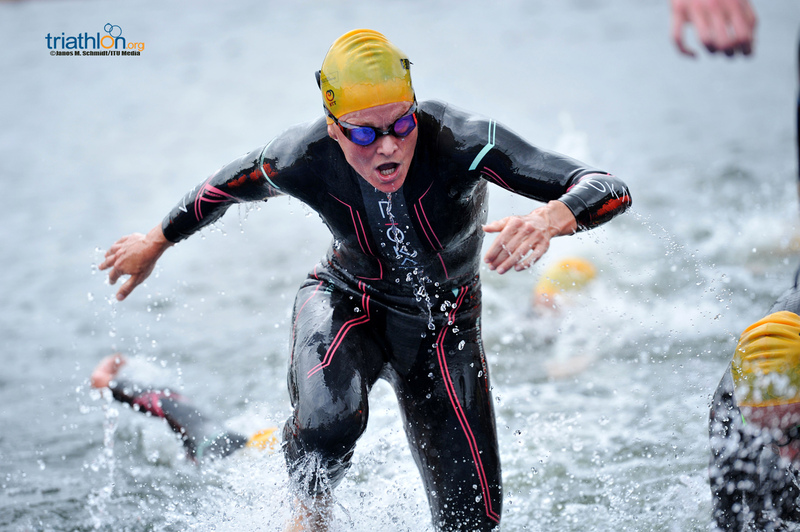 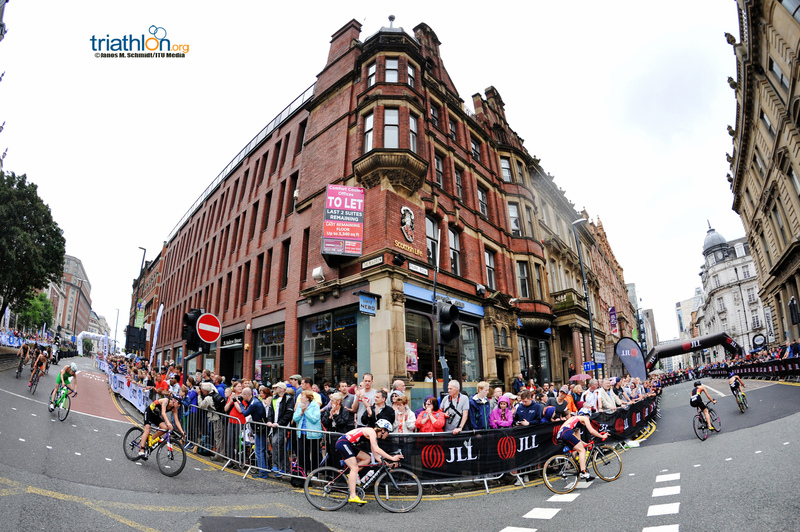 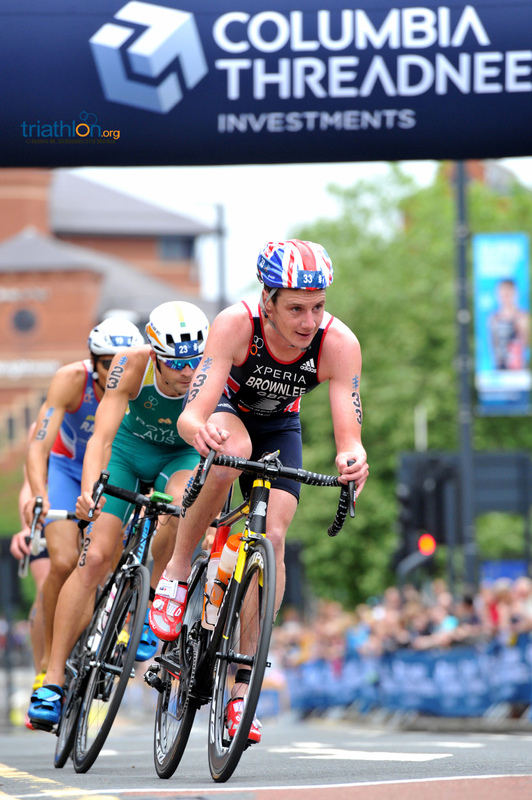 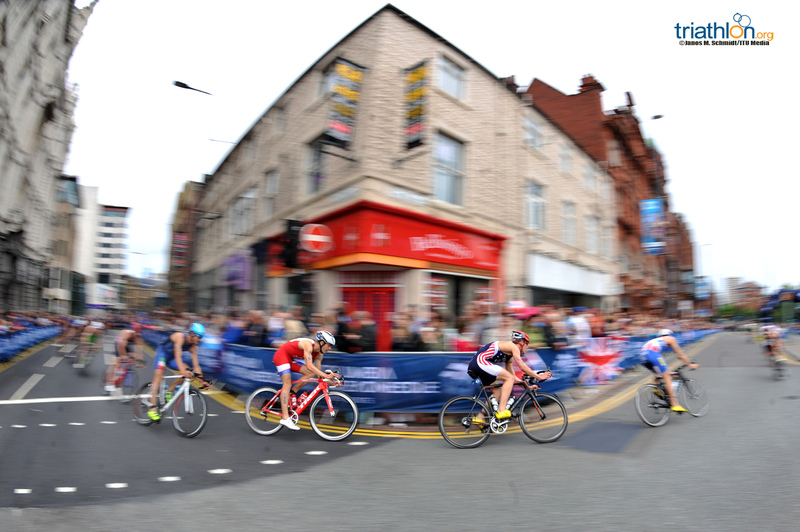 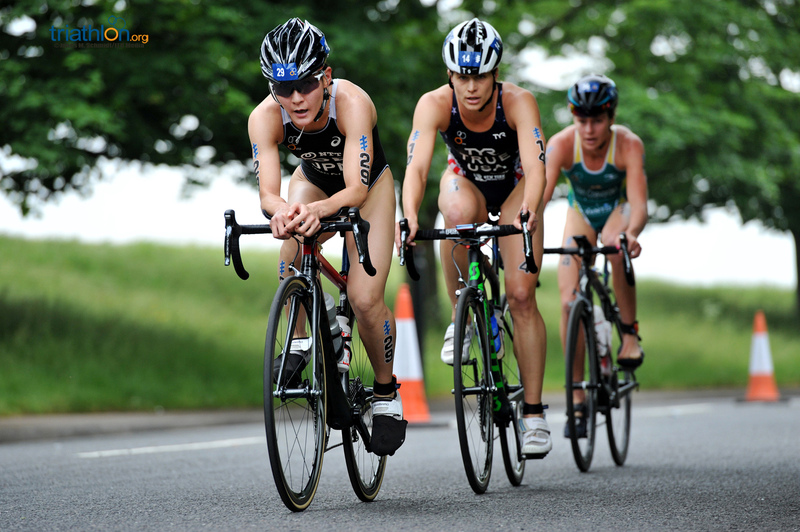 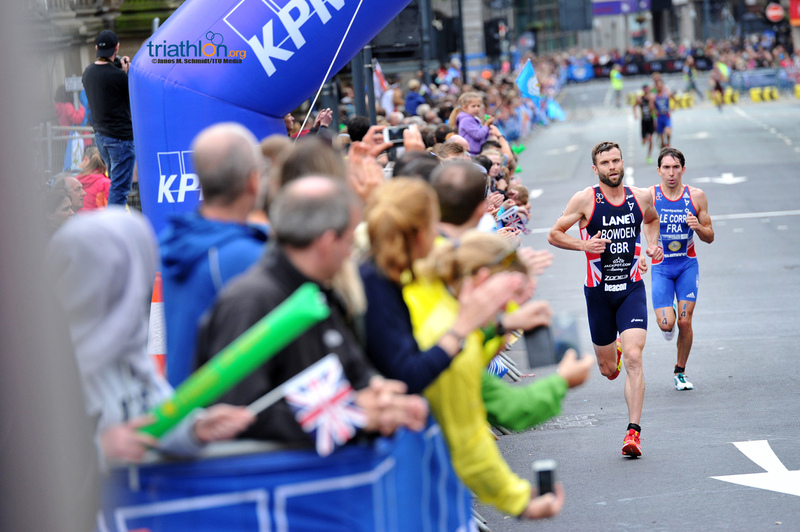 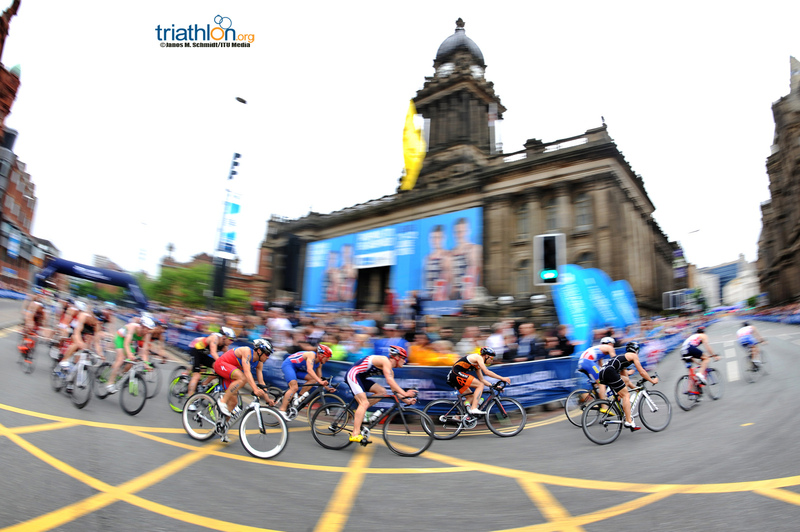 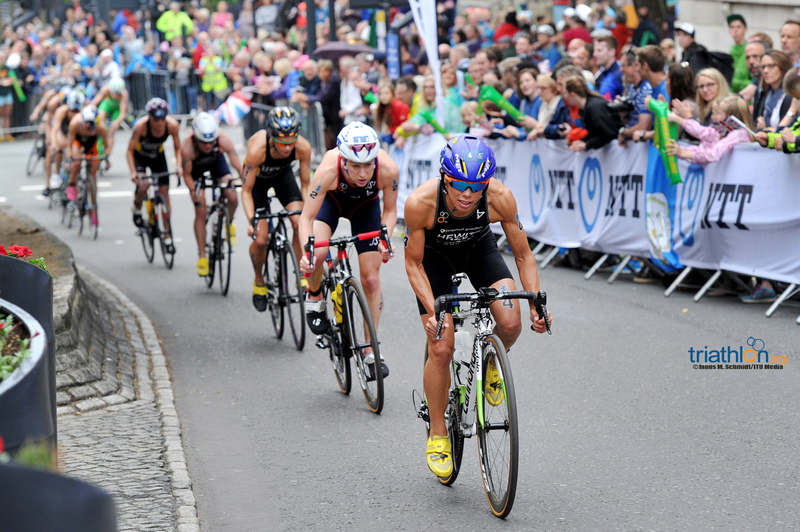 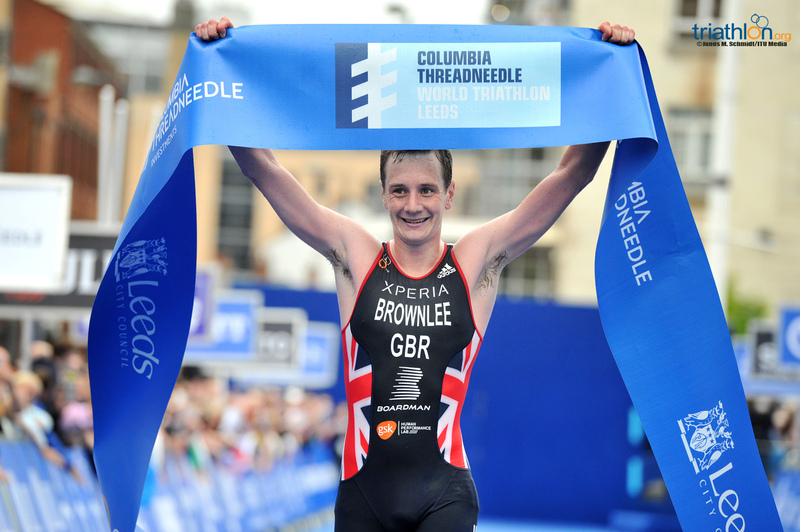 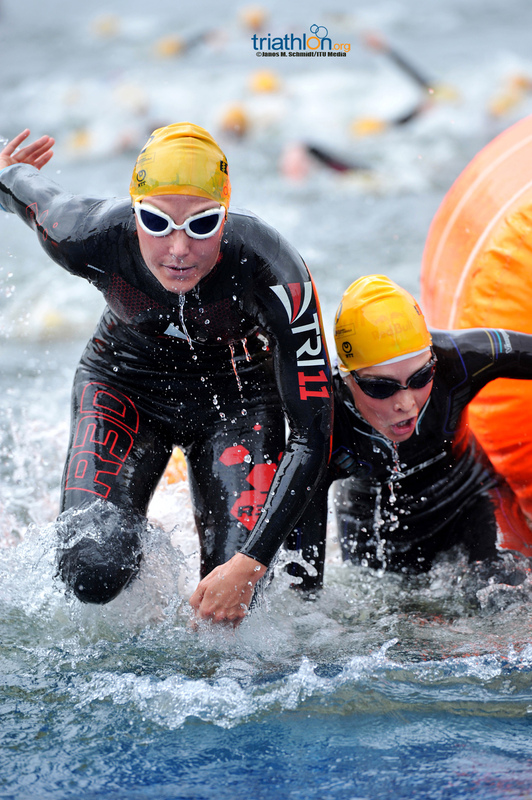 The debut of the 2016 Columbia Threadneedle World Triathlon Leeds on the WTS circuit did not disappoint as yet again Gwen Jorgensen succeeded at executing a come-from-behind run to seize the first-ever Leeds title. 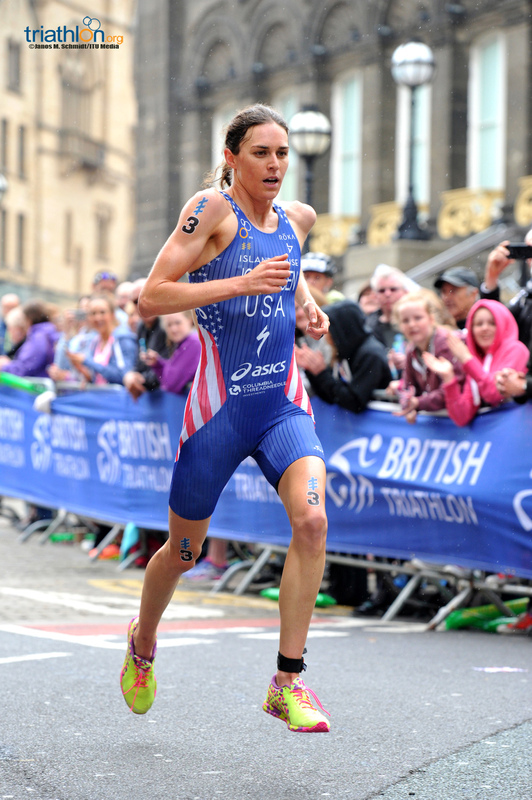 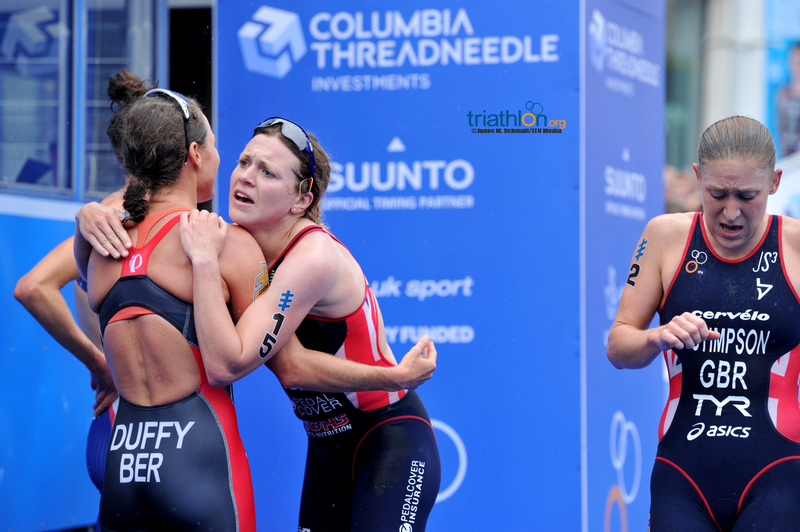 The victory was the second consecutive win for the American and her 17th WTS gold of her career. 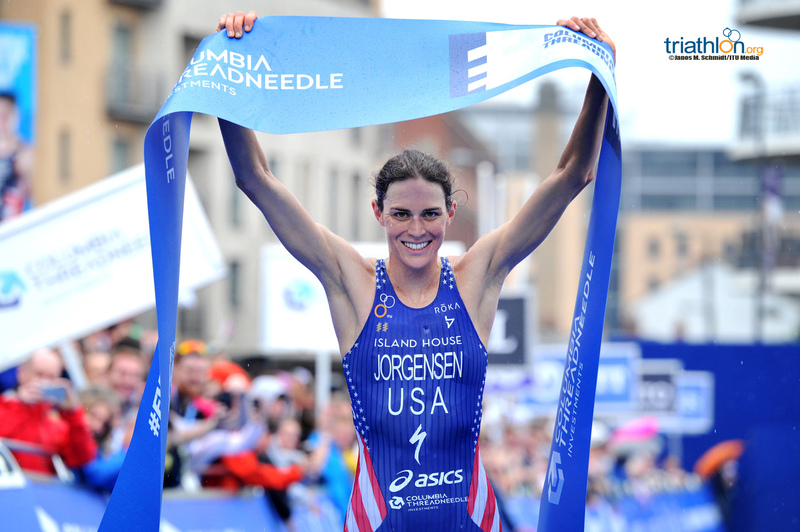 After being down 1:40 at the second transition, Jorgensen was able to overcome from the largest deficit in the history of the WTS to capture her win. 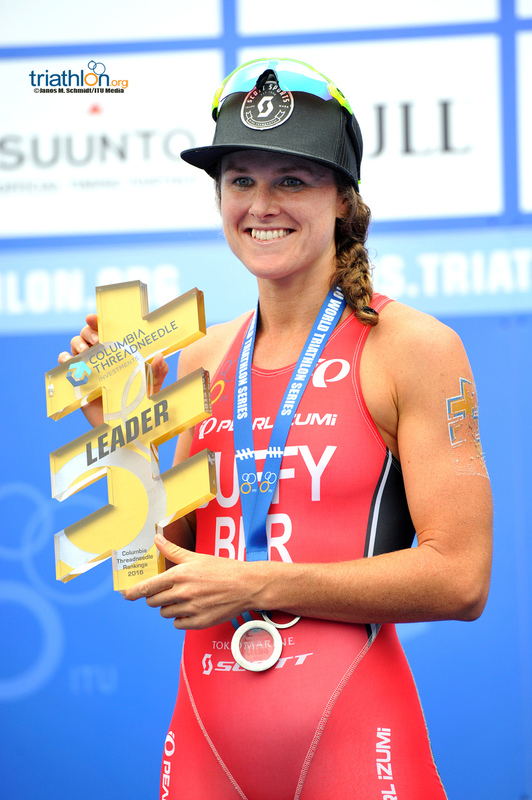 Earning the silver medal was Bermuda’s Flora Duffy, who executed a massive attack early on the bike to gain a lead that was insurmountable to anyone but Jorgensen. 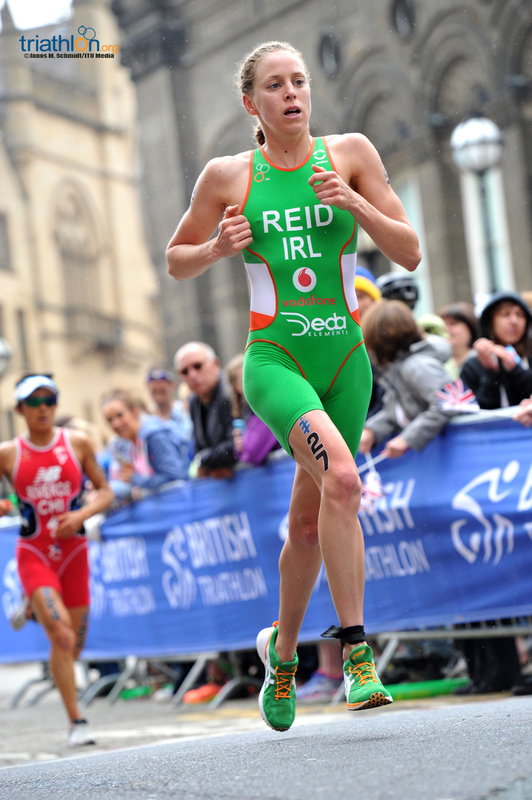 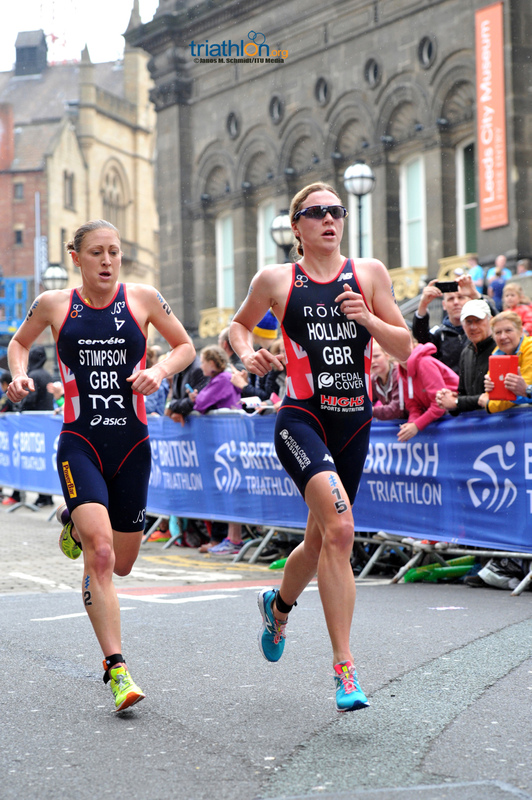 She was followed over the finish line by Great Britain’s own Vicky Holland. 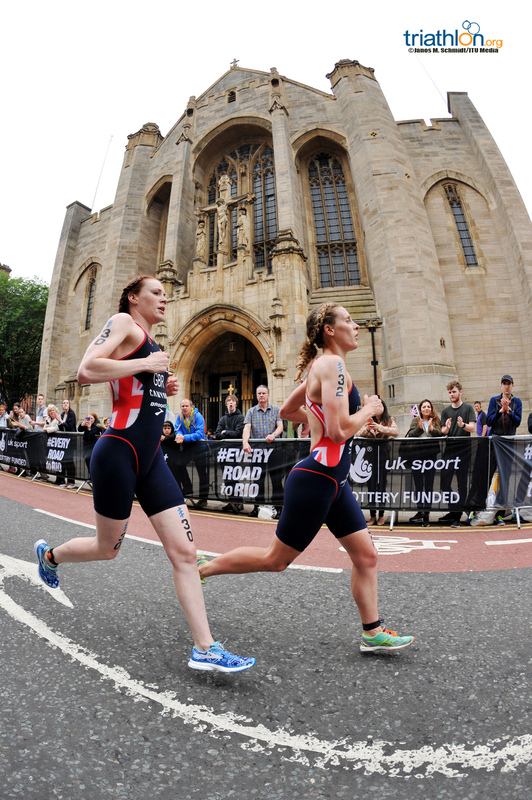 Duffy said of her performance on the day, “Starting the run with Gwen behind you is always a bit of a terrifying thing, but I am happy with how things went today. 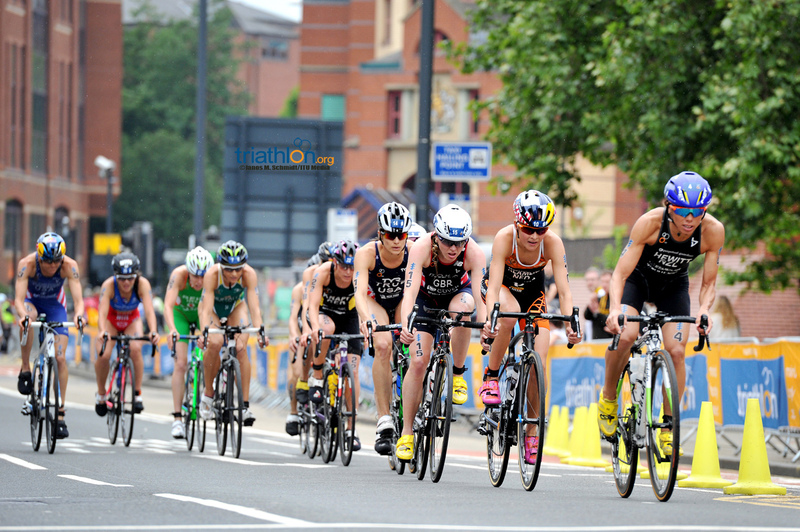 I had to do a lot of work on the bike, the British girls were not working with me, they had some team tactics. 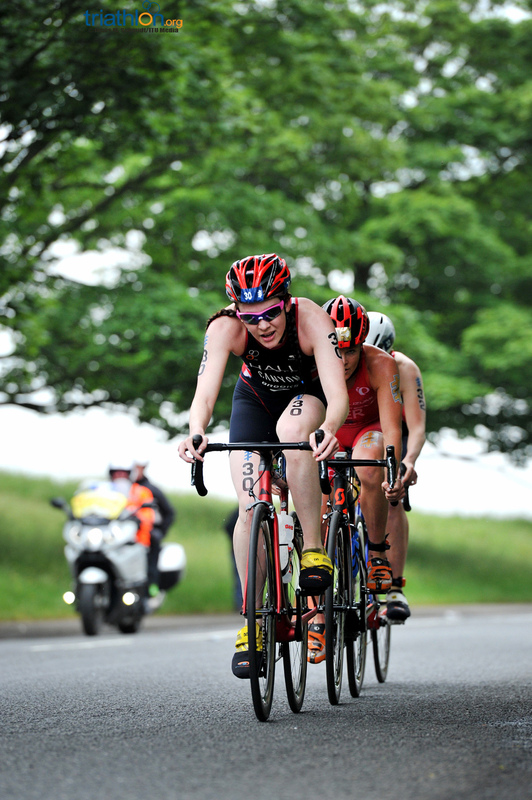 They were told they had to ride a certain way so I was the only one who could put in work, if I had help perhaps I could have run a little bit better and perhaps we could have had a little more time, but that is racing, that is team tactics. 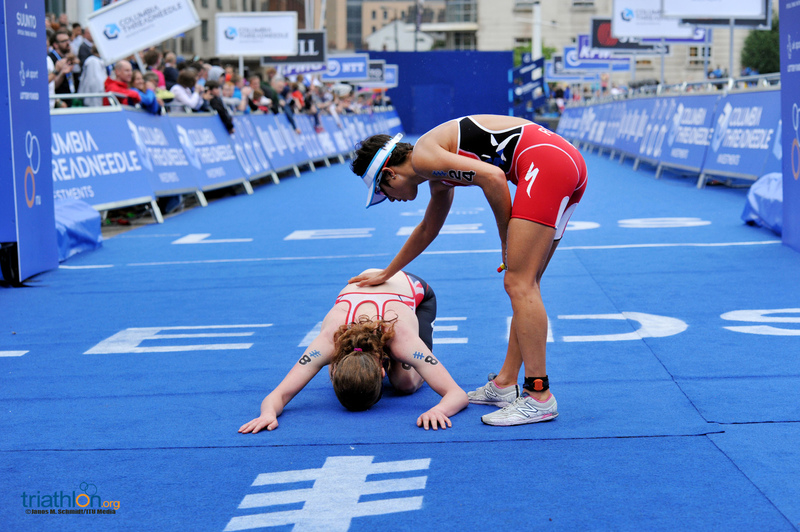 I am the only Bermudian, someday I hope there is an army of Bermudians I hope to help, but yeah it was a great day for me, I am super happy. 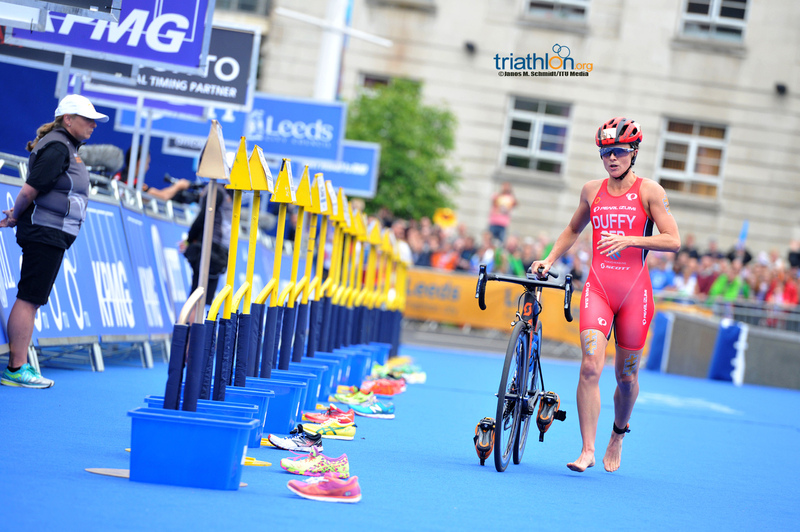 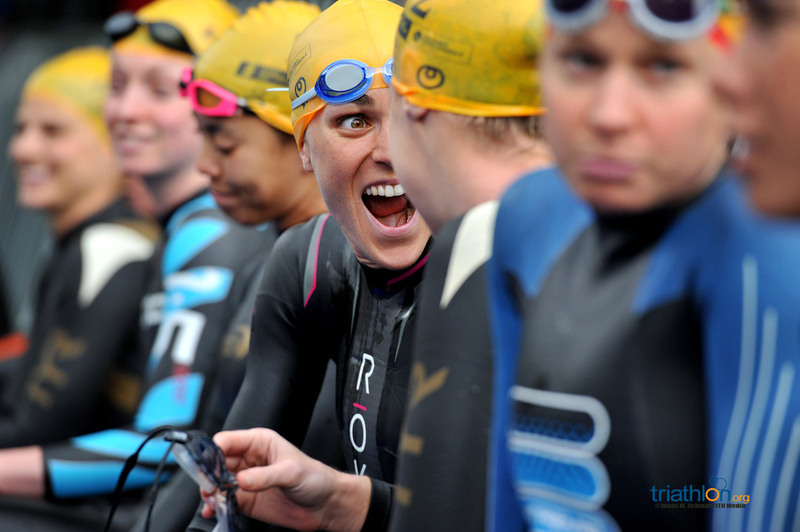 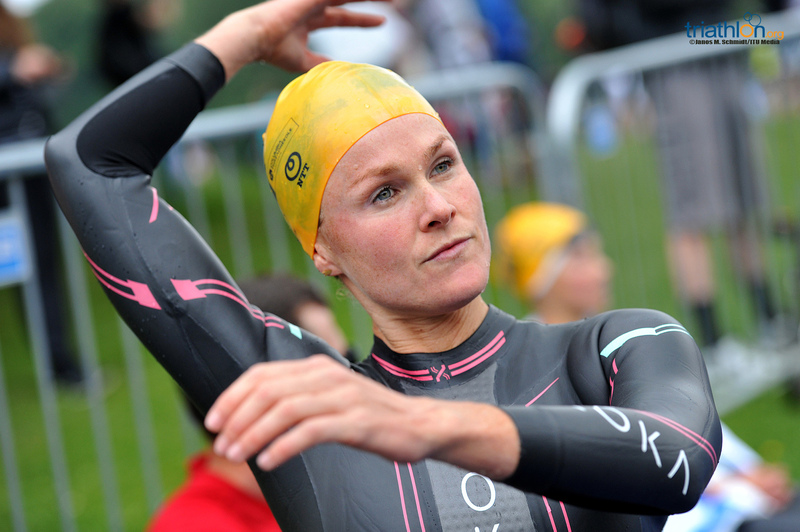 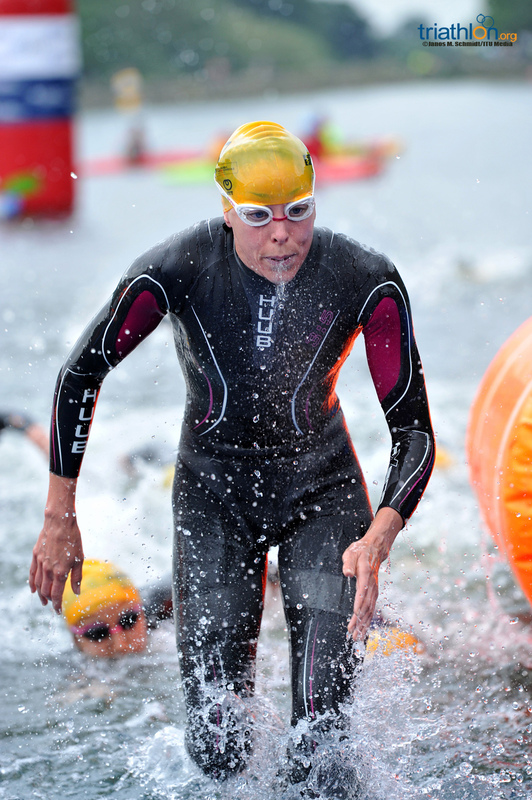 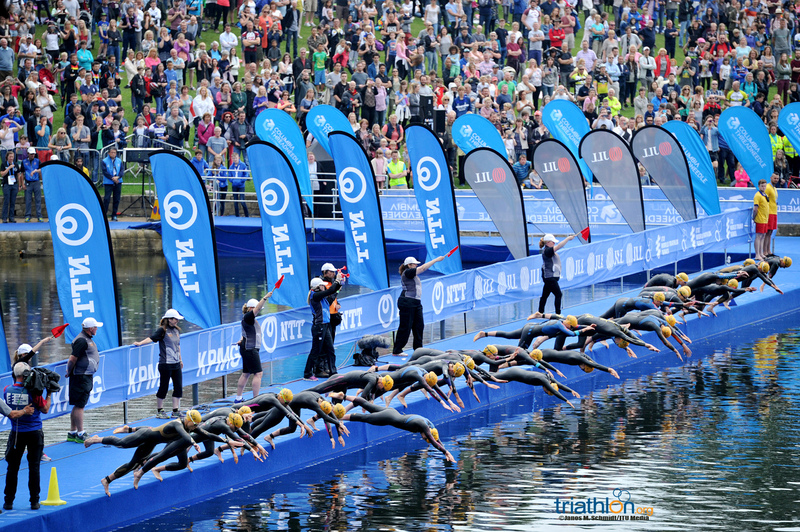 Starting the Leeds swim course with a podium start, a small field of only 33 women lined up for the fifth stop of the 2016 World Triathlon Series season. 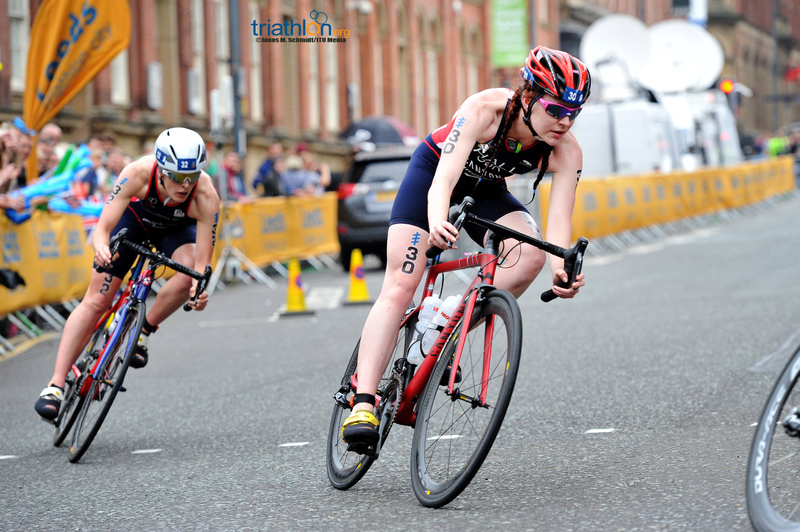 Great Britain’s own Jessica Learmonth and Lucy Hall quickly became the leading two, impressing their home nation crowds just off the start. 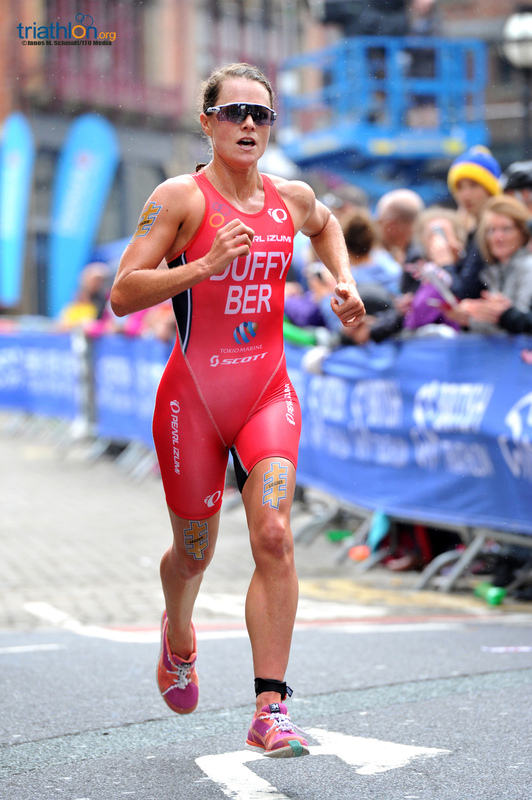 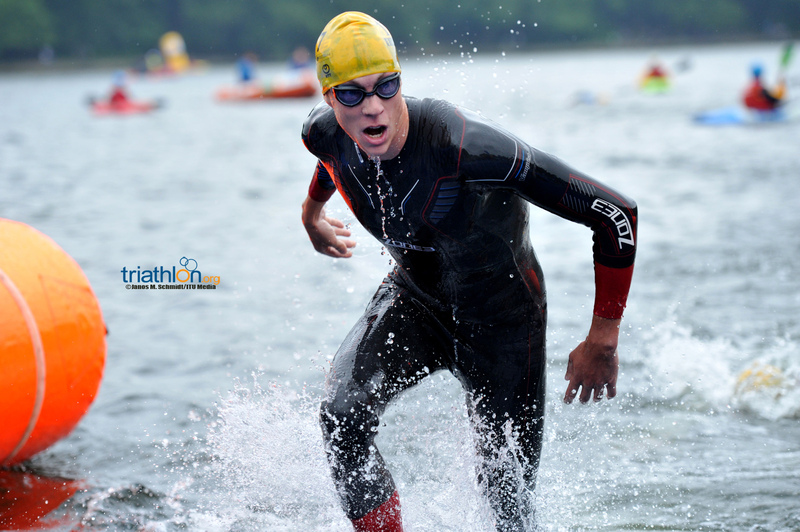 Duffy was also aggressive in the water and remained right on the feet of the two Brits. 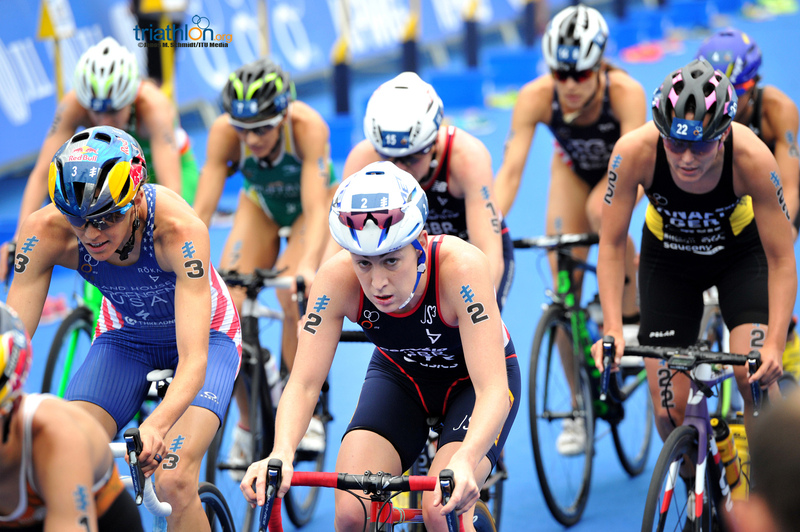 After the first lap, the three led a group of about nine women including Jorgensen, Sarah True (USA) and Holland to create a reasonable gap in the field that carried them into the first transition zone. 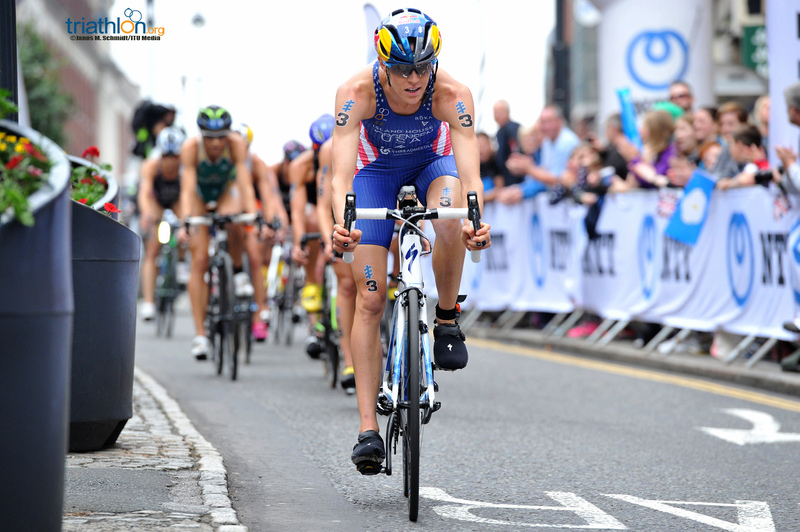 But despite a tight transition, it was Duffy, Learmonth and Hall that were able to get out onto the bike first. 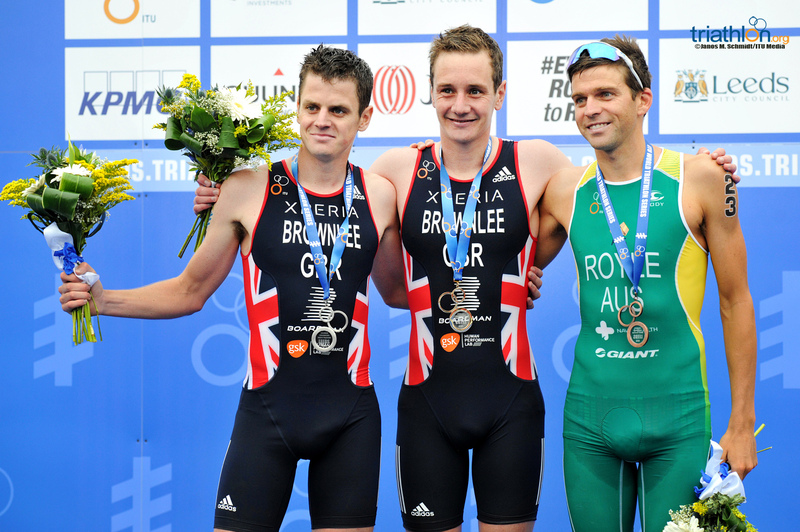 From that point the three never held back. 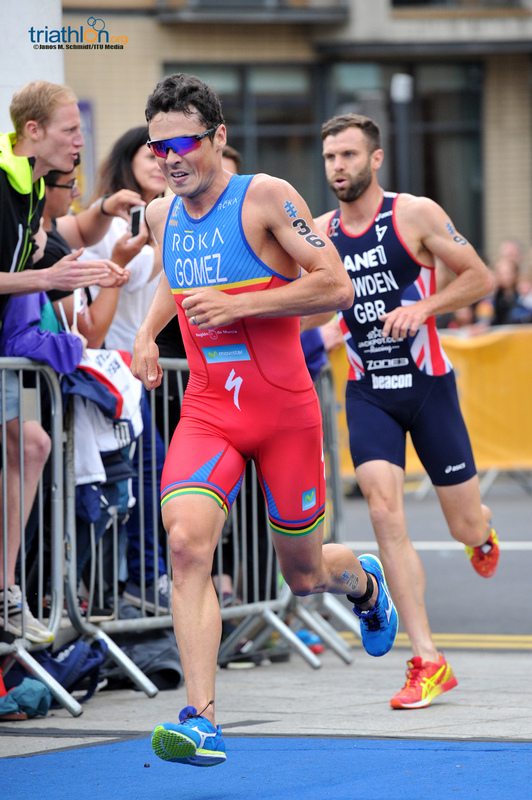 The trio charged forward together and immediately created enough distance to hold off the chasers behind them. 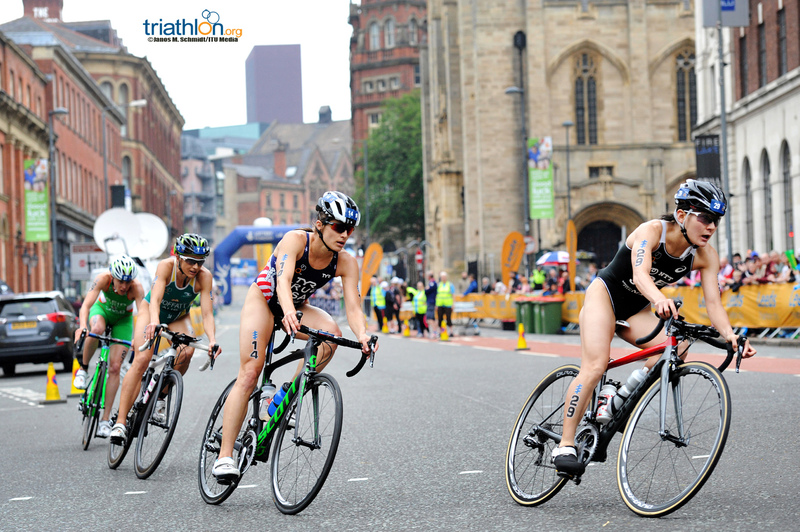 While another bike trio of Jorgensen, Holland and Emma Moffatt (AUS) were able to ride together for the first lap, they were eventually caught by 11 more riders, which included Andrea Hewitt (NZL) and Jodie Stimpson (GBR). 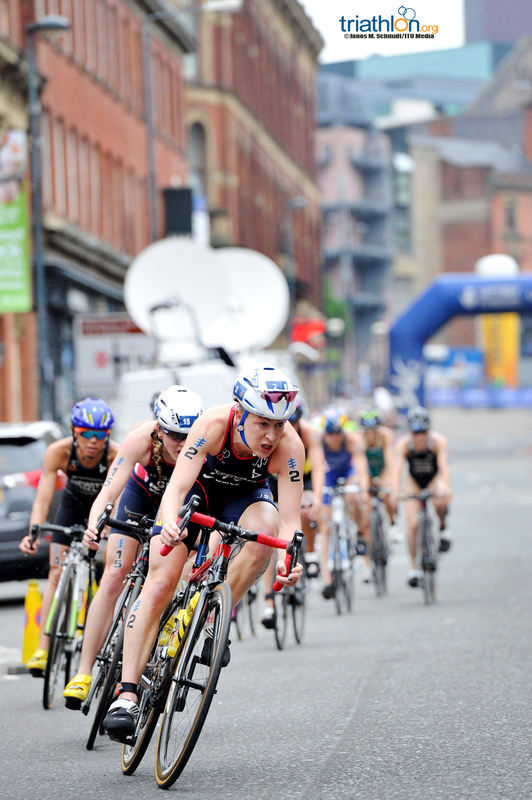 Non Stanford, who trains in Leeds, found herself leading the second chase pack, but would ride the entire bike leg around two minutes behind the leaders. 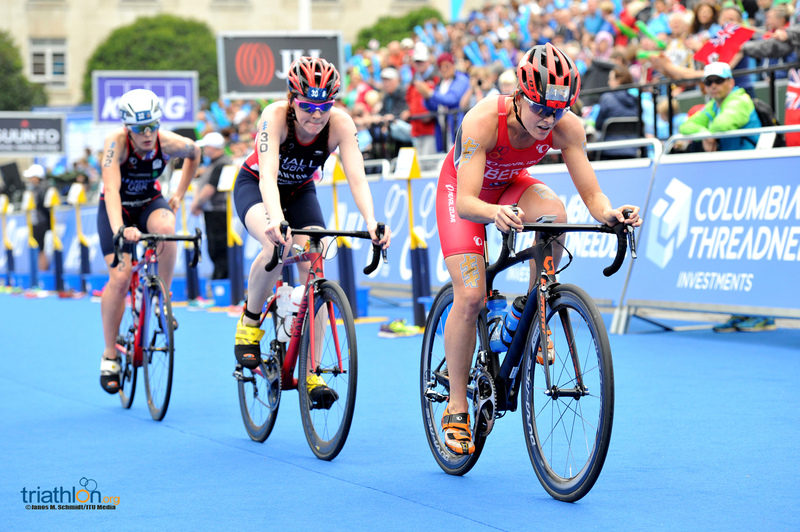 Up ahead, the powerful trio hammered through the seven-lap bike course with a lead over two minutes for five of the seven laps. 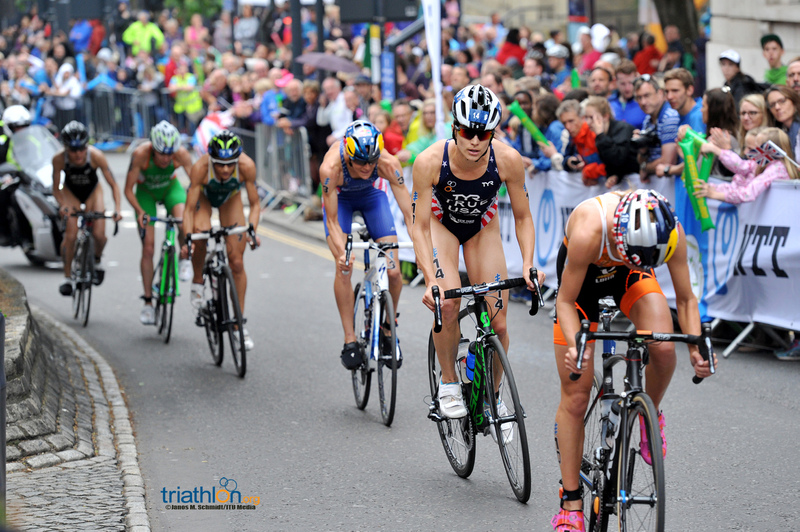 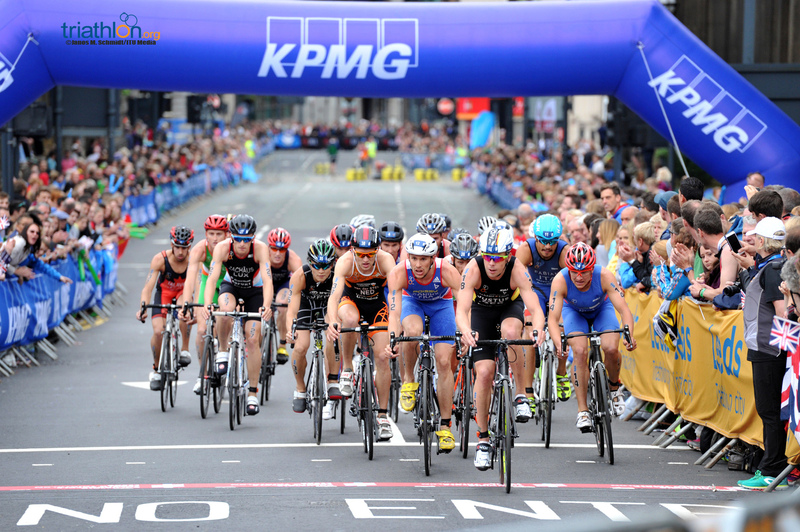 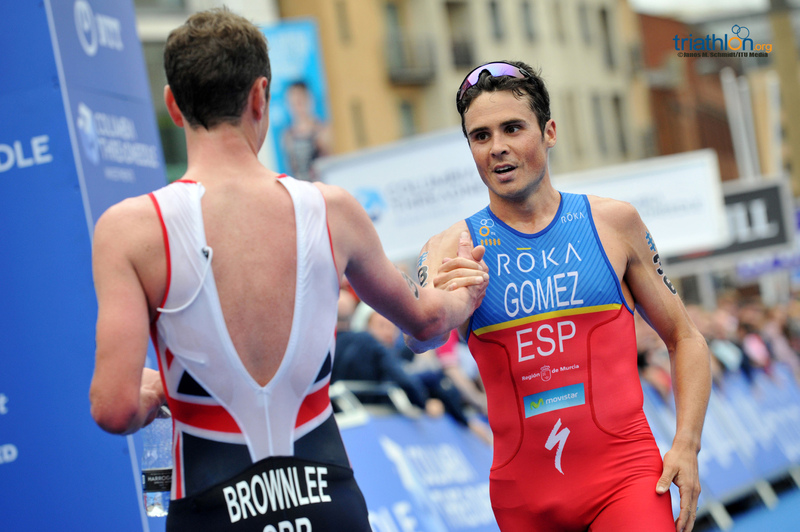 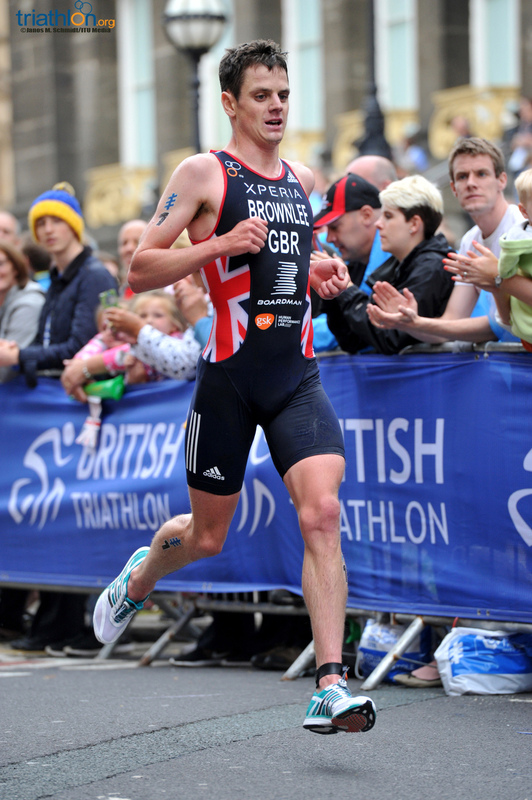 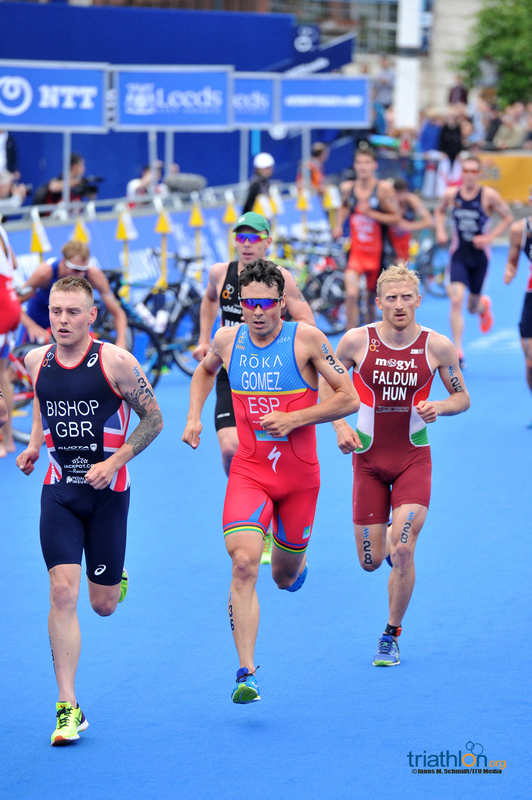 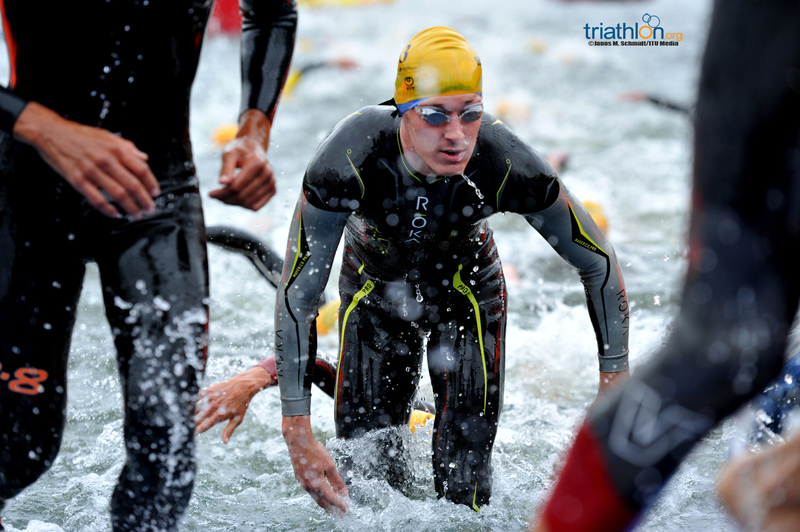 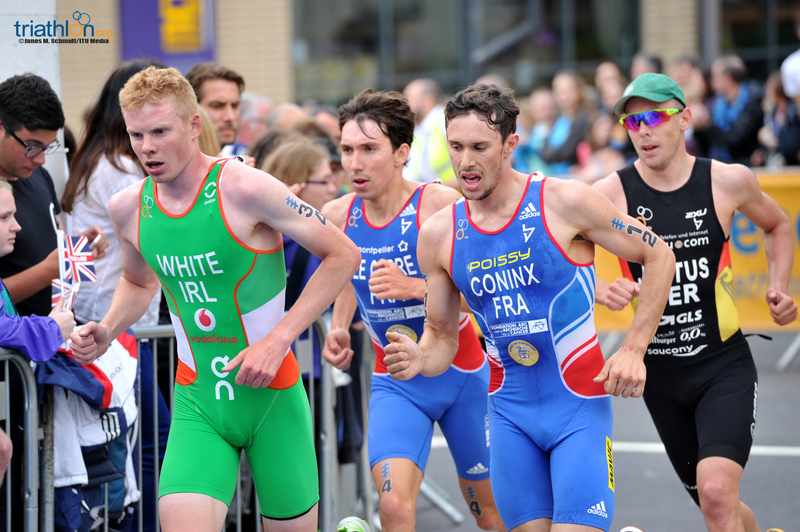 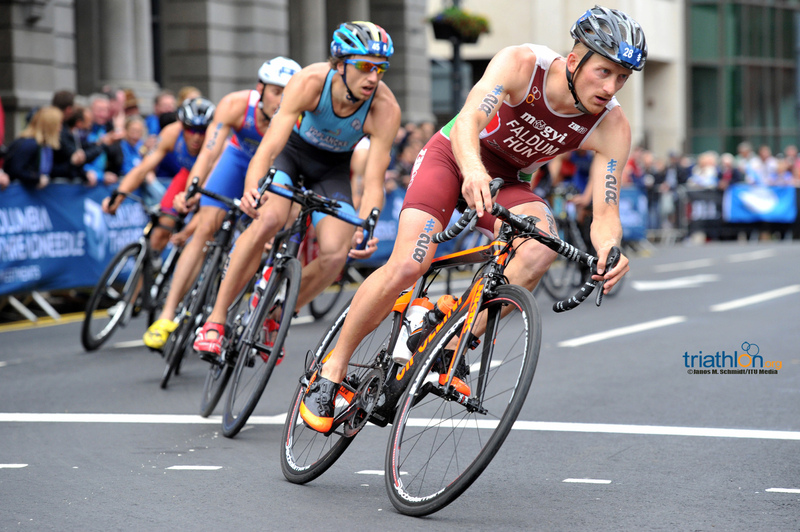 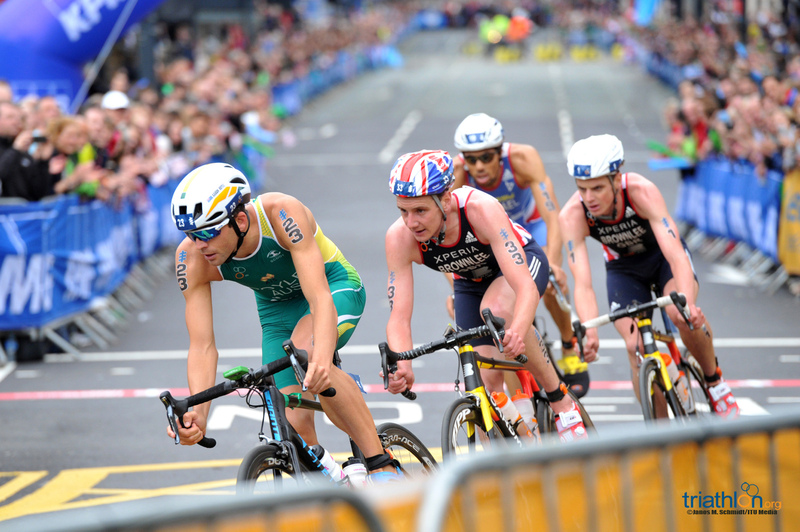 However, as the three entered the second transition zone, they were working with a lead of over 90 seconds. 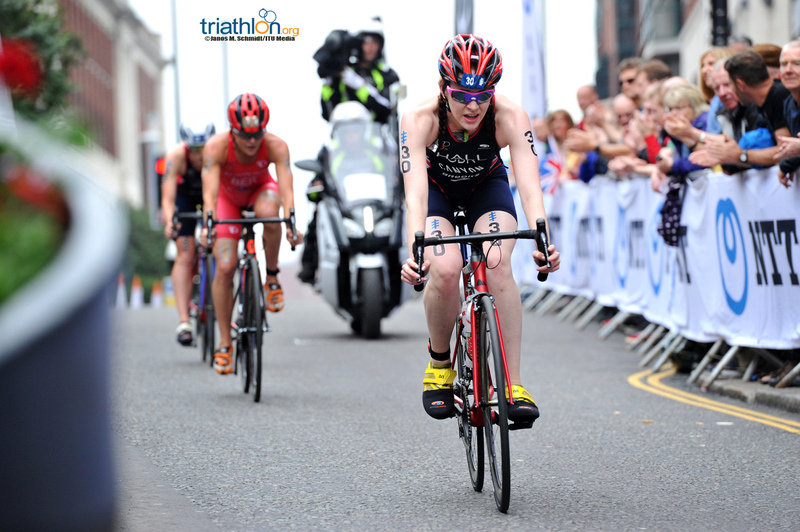 Always the powerful cyclist, Duffy then took her momentum and blasted out of the gate and onto the run as the top contender. 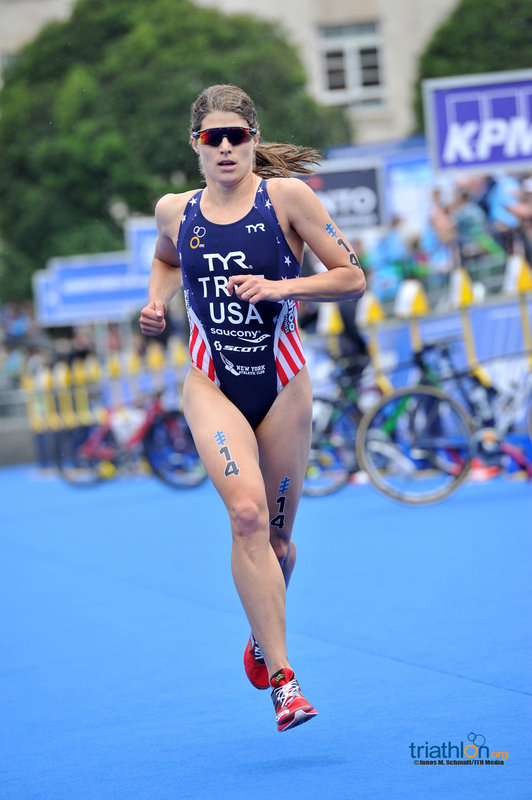 For the first two laps she was able to keep Jorgensen at bay, who started the run with a 1:40 deficit. 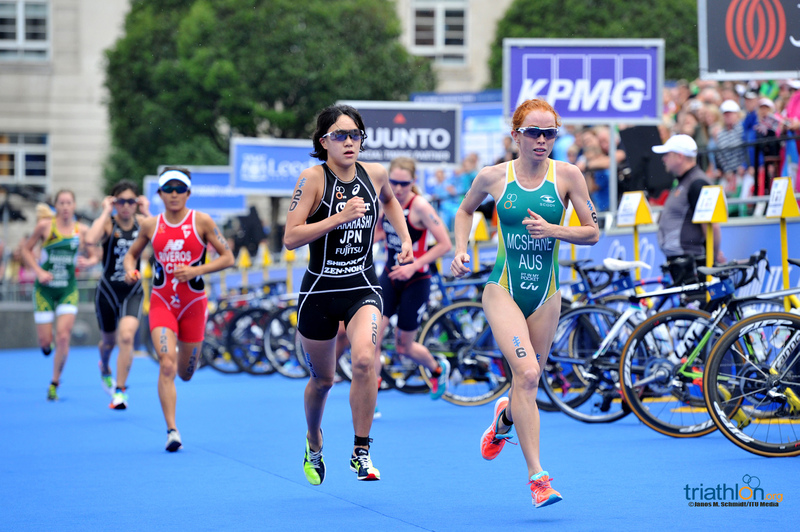 But just as most expected, it took Jorgensen only five kilometres to pull off the run of the day, bypassing Duffy to put herself in the lead of a WTS race once again. 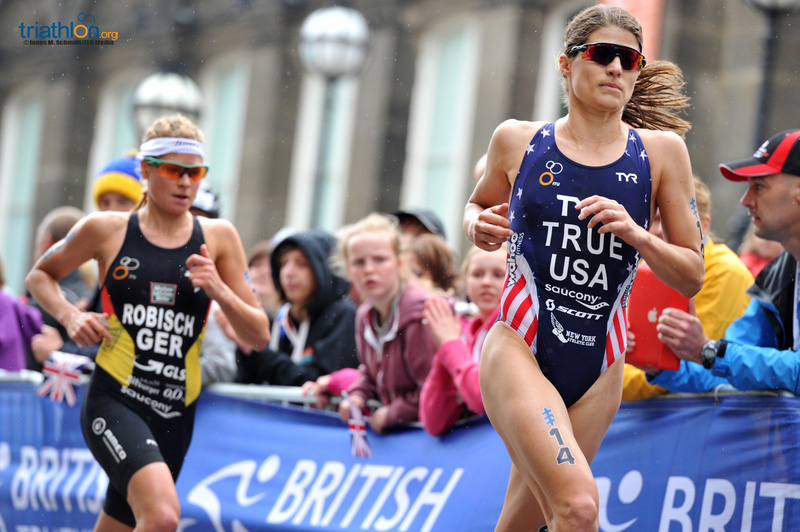 From there, she catapulted forward, flying to the finish chute with a lead of almost a minute. 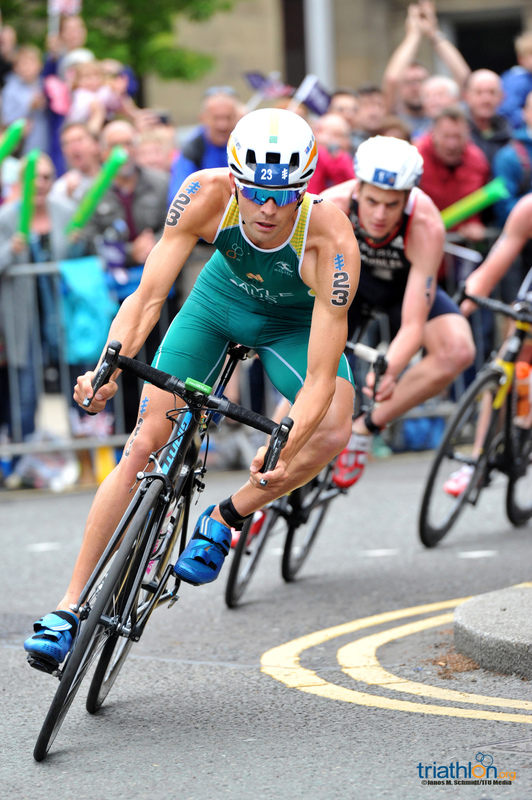 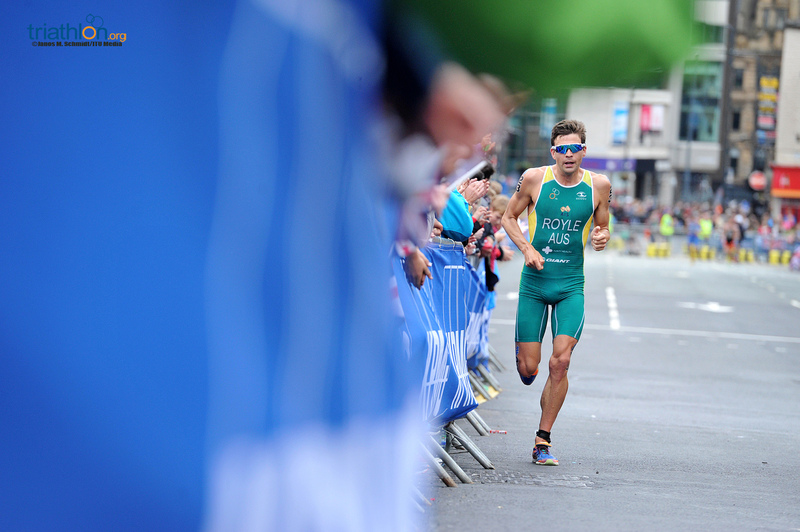 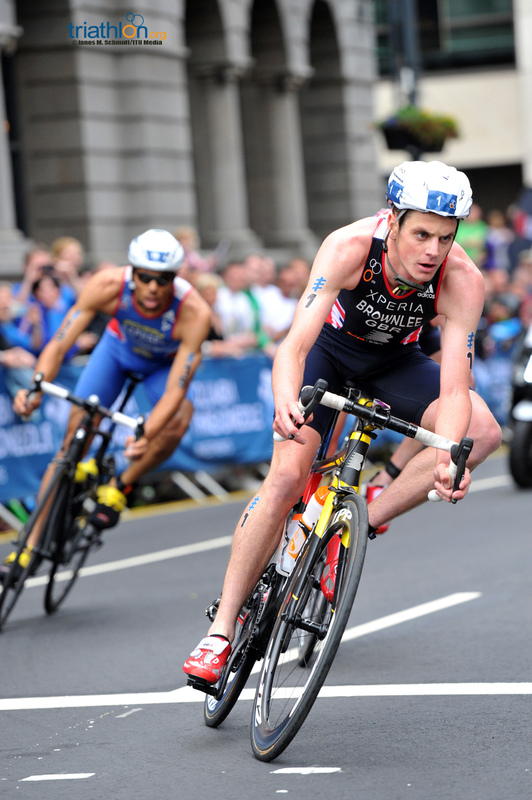 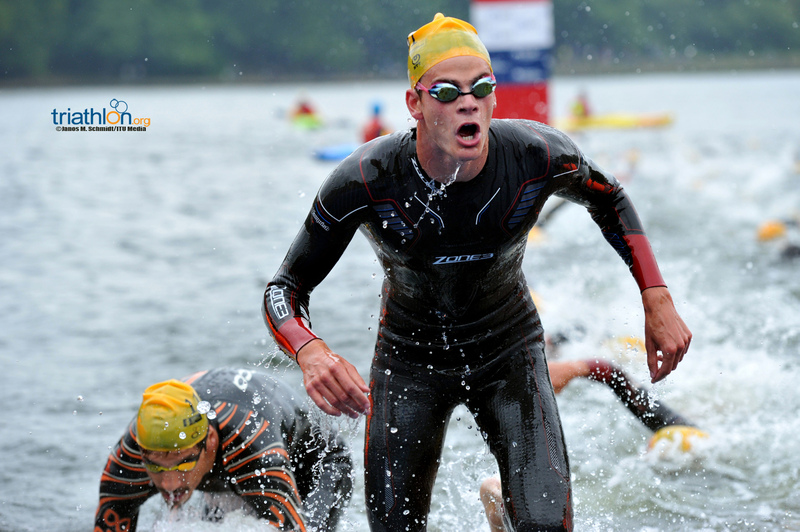 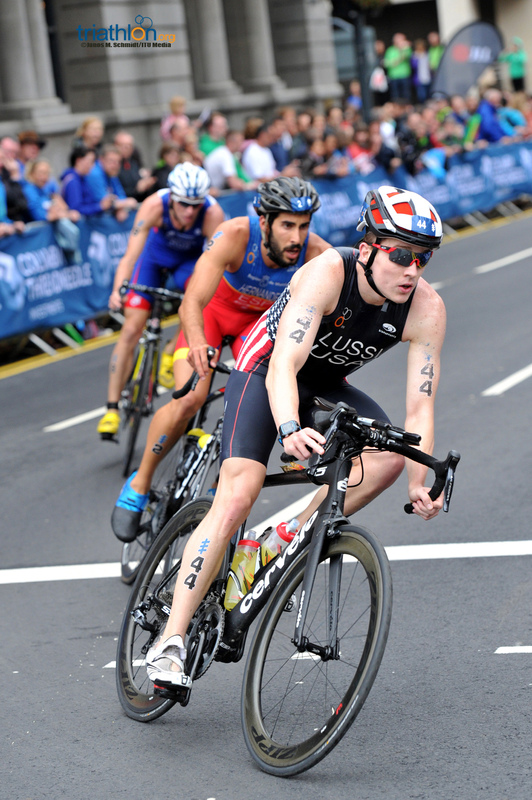 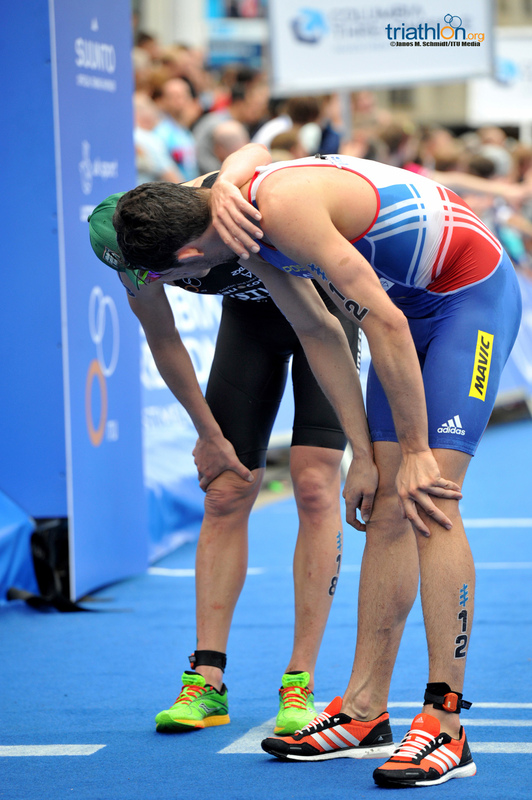 Having been down 100 seconds, Jorgensen overcame the largest gap in WTS history to win a race. 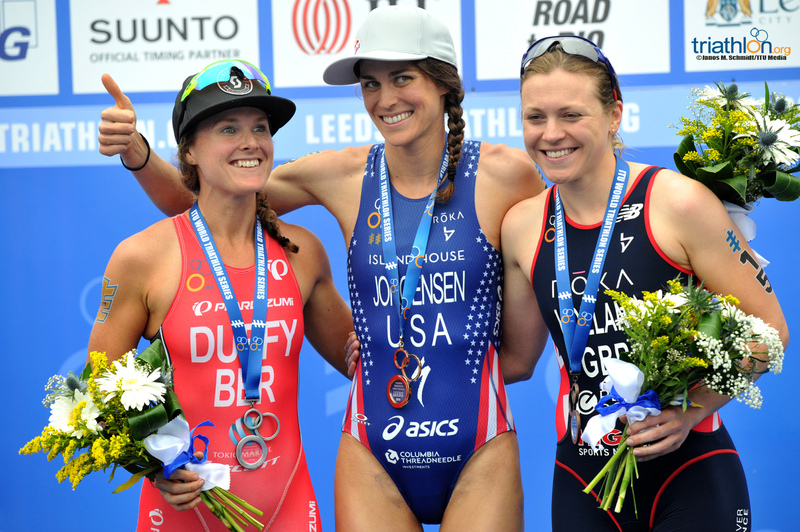 Duffy followed behind Jorgensen and was able to grab the silver medal, her second WTS silver of her career and second WTS podium of the season. 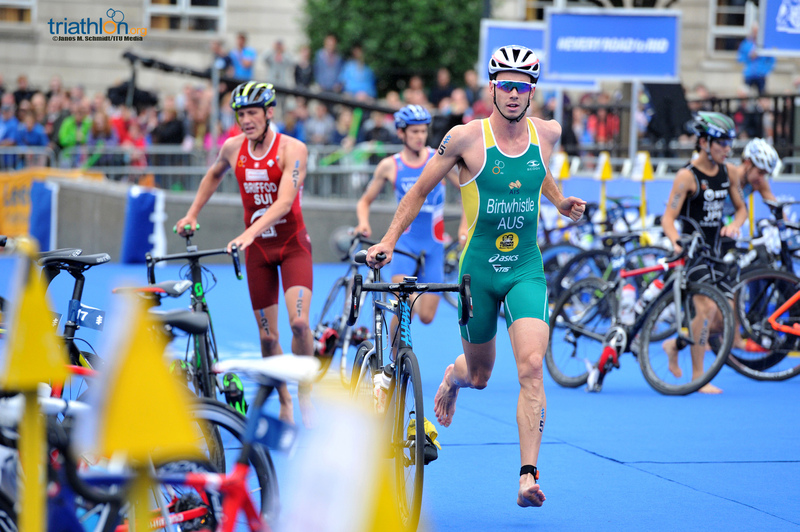 The final podium spot was then left to be completed by Holland and Stimpson, both of whom bypassed fellow compatriots Hall and Learmonth to position themselves into medal contention. 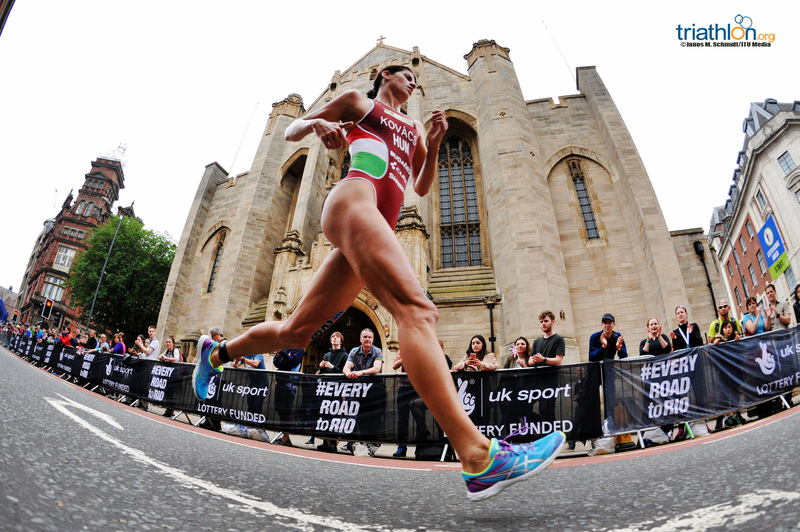 However, with the help of her hometown crowds, it was Holland who had the extra effort in the final 200 metres.